We were sent a complimentary Little Mermaid Legacy Collection CD as part of Entertainment New Media Network. Giveaway is sponsored through the network by Adventures in Familyhood with prizes provided by Walt Disney Records. The opinions here are our own. Walt Disney Records The Legacy Collection is a line of music that celebrates the anniversaries of Disney’s most beloved and classic films. Their latest edition to the collection, The Little Mermaid celebrates the 25th anniversary of the iconic film. We recently had the opportunity to review a copy of the two disc set. Being given this opportunity was a dream come true as The Little Mermaid is a feature that I hold near and dear to my heart. My history with The Little Mermaid goes all the way back to 1989. I loved 1989! I became a teenager, my hair was awesome and I had started my first real relationship. But by far the highlight of my year was the first time I saw The Little Mermaid. Something about the story of an angst-ridden teenage girl struck a chord with me. Also, for me, the strength of a movie is dependent on its soundtrack. I instantly fell in love with the music crafted so beautifully by Alan Menken and Howard Ashman. It’s filled with joy, celebration, melancholy and desperation. The Little Mermaid was the first movie in my generation to mix the latest innovations in animation with such a moving soundtrack. It ushered in an era of new Disney Animated Features. I remember begging the kids I used to babysit for to watch The Little Mermaid each time I sat for them. I couldn’t get enough (and still can’t). 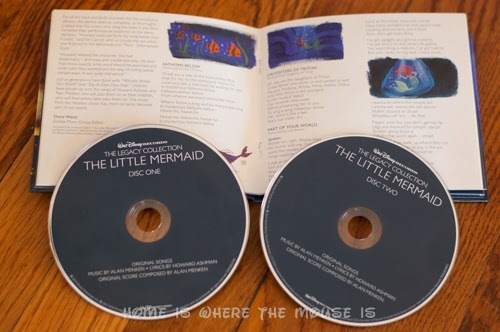 Walt Disney Records The Legacy Collection The Little Mermaid is a two disc set. Disc one features the original songs and score from the film. Disc two is a collection of work tapes and song demos performed by Menken and Ashman. The highlight of the set is the 20 page collectible booklet. It includes anecdotes by the film’s creators, liner notes and a sampling of visual development art from the film. Its cover displays newly created artwork inspired by The Little Mermaid by Lorelay Bove. Besides reliving my younger days, what I loved the most about the new two disc collection was the quality of the music. It was obvious that it was digitally remastered. The sound was so clear that you could hear every instrument. While I’ve seen the movie countless times, I’ve always been so wrapped up in the story to really listen to the score. I loved being able to hear the beautifully arranged score uninterrupted. It helped me appreciate the music of a movie I love so much on a whole new level. 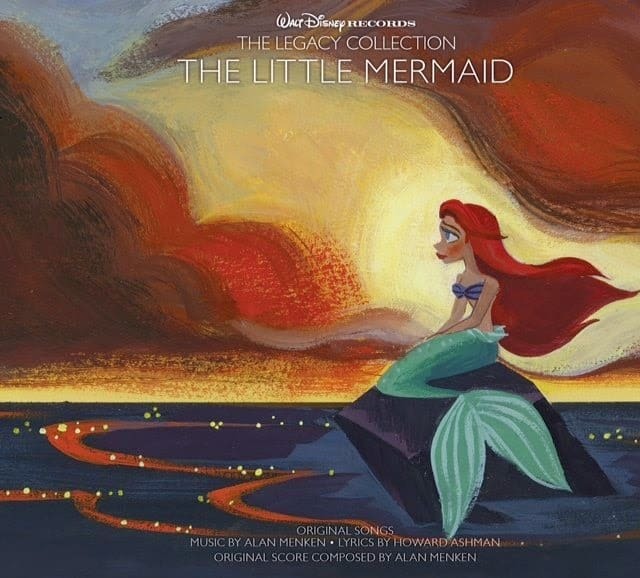 Walt Disney Records The Legacy Collection The Little Mermaid 2-disc set is now available at https://smarturl.it/lclma1 and at Disney Music Emporium: disneymusicemporium.com. For more information on Disney Music Emporium, please visit, DisneyMusicEmporium.com become a fan at Facebook.com/disneymusicemporium or follow at Twitter.com/DisneyMusicEmp. But before you rush over to get your hands on a copy, enter for your chance to win right here! 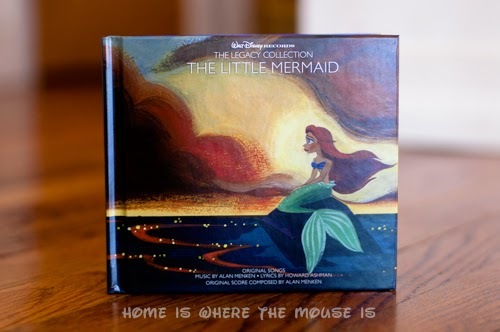 One lucky winner will receive a copy of Walt Disney Records The Legacy Collection: The Little Mermaid courtesy of Walt Disney Records. Use the Gleam Widget below to enter. Giveaway will run from January 7th – January 16th. Winners will have 24 hours to reply. Prizes will be sent directly to the winners from Walt Disney Records. Please allow 4-6 weeks for shipping. What a great giveaway! The Little Mermaid holds a special place in my heart as well. So good! I love listening to the music of The Little Mermaid! Me too! I love singing along on the ride. The 20-page​ book looks gorgeous- I'd love to see it in person! Hope you get to! I learned so much from it too! I was in 8th grade when it came out. Not too far apart. It's a story a lot of teens can relate to. I'd love to her the song demos! The extras are what makes me want to run out and get my own copy!! 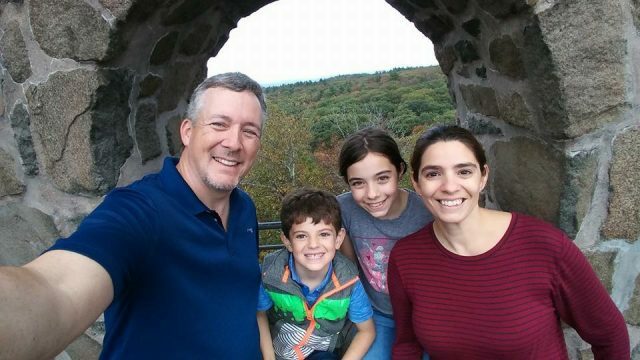 I hope you win! You will love it!